Who Wants to Be a Millionaire is easily one of the most popular game shows to ever appear on the television. Giving everyone a fair shot at life-changing money, the quiz originally featured 15 progressively harder questions contestants had to answer to reach the final goal. The show has been licensed and adapted in countries all over the globe. Now, thanks to Big Time Gaming, all players can experience the thrill of the game show thanks to their Who Wants to Be a Millionaire slot. Featuring the original feel and, more importantly, music, BTG did a great job as far as the setup is concerned. If you enjoyed (and still enjoy) the Millionaire, this game will drag you right in within seconds. Here are the most recommended online casinos to play Who wants to be a millionaire from Big Time Gaming. Ranked number 1 is Voodoodreams NZ. It’s a great online casino and they offer $1000 in casino bonuses + 200 Free Spins to all new players. Second in our list is Leovegas Online Casino. They are one of the best casinos you can play in your mobile and as a new player you can claim up to $1000 in casino bonuses + 222 free spins. Finally, we have 21.com which is a brand new casino that is focusing a lot on New Zealand. They offer a staggering 210 free spins without any deposit needed to all NZ players. 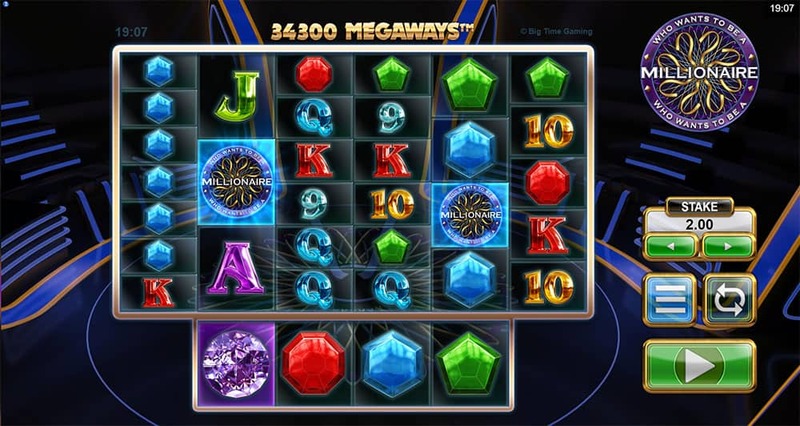 Who Wants to Be a Millionaire slot features Big Time Gaming’s patented megaways, which immediately suggests there are some big potential wins in the pipeline. With six reels and up to 117,649 ways to win that can drop on every spin, this game, like other similar titles such as Bonanza, can always stun you with a completely unexpected screen. The number of megaways changes on every spin but, as a general rule of thumb, more ways usually means a better chance of a big win. Purple diamonds are the top paying symbols in Who Wants to Be a Millionaire, followed by red, blue, and green gems. Playing card symbols appear on the reels as well, although they pay significantly less than gems. Big Time Gaming really pulled out all the stops with Who Wants to Be a Millionaire slot. Not only the game features original exciting music and recognizable effects but the bonus feature, triggered by landing three or more Millionaire scatters, will give you a chance to take the hot seat and try to climb your way to the top. Once the bonus is triggered, you’ll be faced with the familiar prize ladder (albeit with only 13 steps). 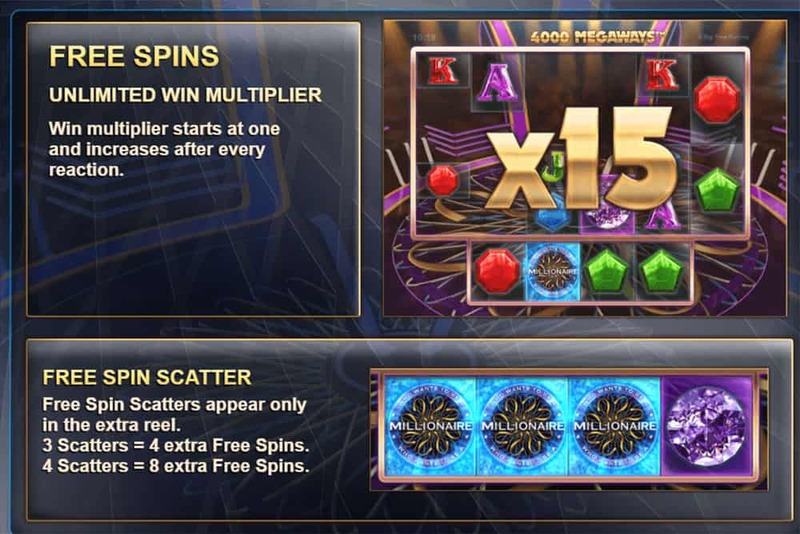 You begin with 8 spins and are offered a chance to either take them and try your luck or answer the question for your chance to get to 10 spins, which is also the first threshold. Every time you answer another question correctly, you’ll earn more spins but if you give the wrong answer, you’ll drop to the last threshold. The maximum number of spins you can win is 50. Unfortunately, questions aren’t actual trivia but rather you’re given a choice based on three popular lifelines (50/50, Ask the Audience, and Phone a Friend). While these give you a better shot at moving forward, whether you do or don’t is based on the luck alone. 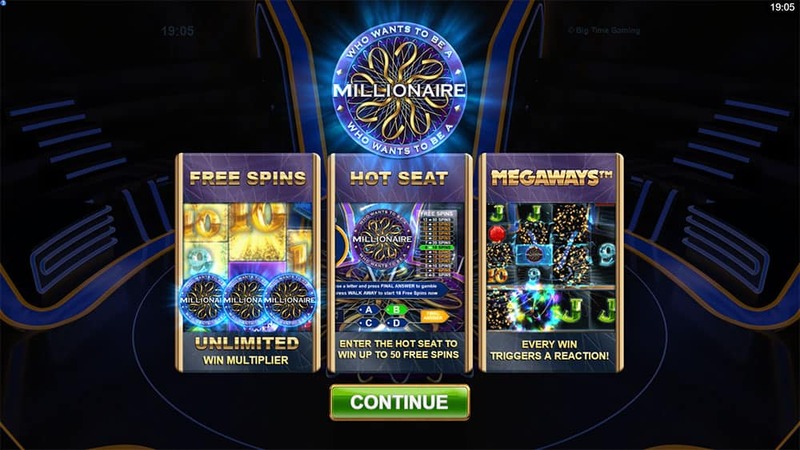 Once you’re done with the Hot Seat, you’ll enter the free spins bonus with the number of spins you managed to accumulate. As with the actual game show, you can always walk away and take the spins you have by that point. In the free spins, like in the base game, every win triggers a reaction, with winning symbols disappearing and new ones dropping in. In the bonus, however, every win also increases the win multiplier by one, just like in Bonanza. So, with a bit of luck, WWTBAM slot can produce some really huge wins. All in all, this slot from Big Time Gaming is definitely an exciting one, especially if you’re a fan of the original TV show. However, the Hot Seat part of the game can be somewhat frustrating, especially if you lose after coming close to the top or if you lose on the first questions a few times in a row, which happens sometimes. So, try to keep calm and don’t let the game get under your skin.